This is an Indian dish made from black eyed beans, alasande kalu is a Kannada (India) word for black eyed beans. This dish is served as main side dish with rice, rotis and chapatis. My mother, oftenly, used to prepare this dish, this dish has a different flavour of its own, it is very delicious and full of proteins. I learnt it from my mother, she used to prepare it on stove (lakadi ka chulha). Now a days, we are using pressure cookers and gas stove. This food is very low in Saturated fat, sodium and Cholesterol. It is also a good source of Protein, and a very good source of Dietary Fiber. This dish tastes very spicy and tasty. It may take 30 minutes to prepare. Let’s see the preparation of delicious curry. home. I have written about preparation of tamarind paste in my earlier blog post. 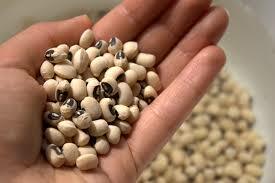 Wash Alasande/Black eyed beans with plane water and add 3 cups (around 600 ml ) of water to it. Pour washed beans with water directly in to a pressure cooker (capacity of 2 or 3 litres), leave it to soak for 30 minutes. Chop tomatoes in to small pieces and pour it into pressure cooker. Close the pressure cooker with lid and Keep the cooker on medium flame. Allow it to whistle thrice and remove the cooker from heat. It may take 15-20 minutes to whistle. Cooking on low or medium flame, helps the beans to cook properly and softly. Allow the cooker to cool down. It mayl take 10 minutes to cool down. Meanwhile you can prepare masala. Place a small kadhai/frying pan on medium flame. Pour Coriander seeds, Cinnamon, Fenugreek seeds (methi seeds), 1 tea spoon of Cumin seeds and Red chilly one after other keeping 1 minute difference. Roast them altogether for 5 minutes Or you can roast them until they start leaving aroma. Grind the all roasted masala and coconut with hing to a fine powder and keep it in a bowl. Remove the lid of pressure cooker and mash the beans with a spoon coarsely. Place a utensil/sauce pan on medium heat, pour oil into it and add mustard seeds. Allow them to split and add cumin seeds, curry leaves, turmeric powder, one by one. Pour mashed beans along with all its water to it. Add tamarind paste and salt to it. You can change the measurement of tamarind paste and salt according to your taste. Add grounded masala and chopped coriander leaves to it. Allow it boil for 10 minutes. Boiling more makes the dish tasty and enhances flavour. Serve it hot with plane rice or rotis or chapatis. It is a multipurpose curry, tasty and healthy as well.